Investors who love dividends and value may want to put these three stocks on their radar. One of the best investment strategies for long-term investors is a simple one: Buy solid companies at great prices, and hold on for a very long time. While measuring "solid" and "great" isn't always straightforward, sometimes all it takes is a deeper look at beaten-up industry leaders. That's why I think Cameco Corp. (NYSE:CCJ), Mosaic (NYSE:MOS), and Aqua America (NYSE:WTR) are three dividend stocks that warrant further attention. Investors have been hearing about the nuclear renaissance for years now, but it always seems to be several years away. Frustrating. Which, as it turns out, is also a great word to characterize the stock performance of the world's leading uranium miner in the last five years. Cameco Corp. is down 45% in that period, although it has gained 74% since last November. Historically low uranium prices have hurt both the top and bottom line in the last several years, while impairment and adjustment charges have taken a toll on earnings, too. The good news for investors is that the dividend has remained untouched thus far, keeping at a steady $0.10 per share quarterly payout since the beginning of 2011. That's a yield of roughly 3.1%. Even better: several positive developments in the uranium market have investors hopeful that a rebound is on the horizon. 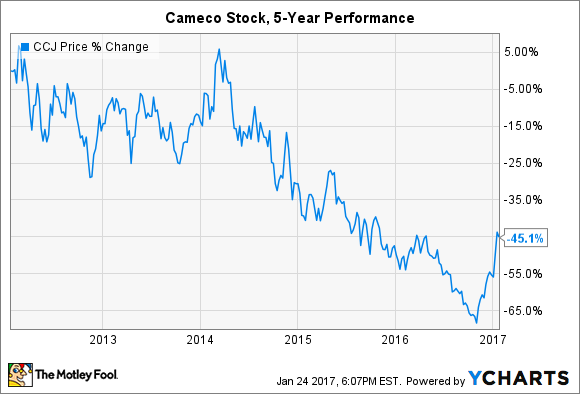 So, is Cameco Corp a bargain stock? The stock is currently priced at a 27% premium to book value, but that will get worse after full-year 2016 financial results are released. Management already announced preliminary results that included massive asset adjustments, which will have a negative impact on the balance sheet and earnings. The more telling sign of what direction the stock may be heading is the large difference in trailing and forward P/E ratios. Analysts expect the company's profitability to increase by a factor of three in the next 12 months, which would lower the P/E ratio from 97 today to just over 30 a year from now. A P/E ratio of 30 may not seem like a bargain, but keep in mind that most of the company's competitors are small and unprofitable. If uranium prices recover in the long term, and you want to own a solid company to gain exposure to the promise of a nuclear renaissance, then Cameco Corp. is your best bet. When North American peers PotashCorp and Agrium agreed to merge late last year after being battered by a prolonged slump in fertilizer prices, it left Mosaic Company as the odd man out. That's not necessarily a bad thing. After all, as the third member of the export cartel known as Canpotex, it should benefit from a stronger alliance between its peers. And while the company has also been negatively impacted by low nutrient prices, it remains the only large fertilizer supplier that didn't cut its dividend payouts. The dividend stock currently yields 3.3%. A volatile 2016 ended with a strong rally for the stock, but it's still down 39% in the past five years. Things appear to be getting better for the company. It recently acquired the fertilizer business of Brazilian agricultural specialist Vale S.A. for $2.5 billion. The deal immediately makes Mosaic Company the largest fertilizer supplier in Brazil and provides assets in Peru, Argentina, and Canada -- opening doors for significant future value creation. The company could see improving margins in the near-term, too. It met or exceeded guidance for the third quarter of 2016 and expects a healthier pricing environment in 2017. That could mean last year was the bottom for nutrient prices and profitability. So, is Mosaic a bargain stock? 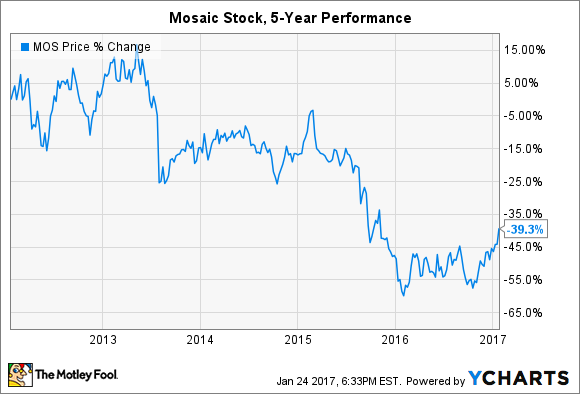 Mosaic Company trades at a 18% premium to book value, which, save for 2016, is the lowest premium shares have traded at in the past decade. It's also significantly lower than peers PotashCorp (2.07) and Agrium (2.39). A price-to-sales ratio of 1.57 is also historically low, save for 2016 and a brief collapse during the financial crisis of 2009. It's easily lower than Potash (3.94) and slightly higher than Agrium (1.10), which has a strong retail business that has served it well during the recent downturn. Analysts currently expect Mosaic Company to wallow in low profitability in the next 12 months, evidenced by a forward P/E ratio that is larger than its trailing counterpart. While even management expects a slow-paced, multi-year recovery, the Vale acquisition and growing demand for the company's products to start 2017 could force analysts to revise their earnings estimates higher. Aqua America shareholders have little to complain about. The stock is up 73% in the past five years. However, it went sideways in 2016 and has lost 15% since July -- underperforming most peers. Why is Mr. Market raining on the company's parade? The water service provider has steadily grown revenue from just $750 million in 2012 to $814 million in 2015 and pays a healthy 2.5% dividend that has grown 46% in the last five years. Moreover, record investments in infrastructure in 2017 will help to acquire new customers, retain existing ones, and lower costs for the company. 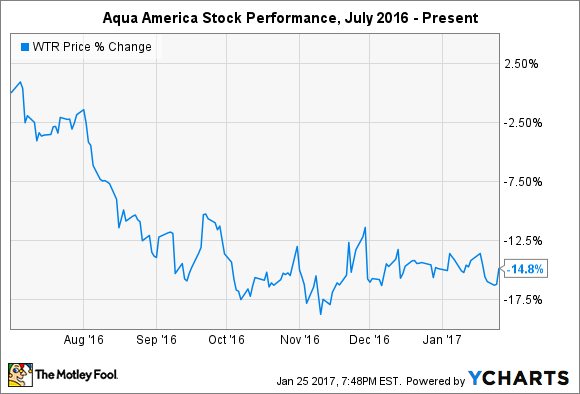 So, is Aqua America a bargain stock? Aqua America trades at a 190% premium to book value, which is sandwiched in between comparable peers, while the stock's price-to-sales ratio is significantly higher than peers. However, it also boasts the lowest P/E ratios looking back and forward, which helps to explain the premiums. When it comes down to it, investors looking at the company have to believe that it boasts opportunities for ample growth. Given its presence in states with aging infrastructure -- Pennsylvania, New Jersey, Virginia, and Illinois -- that assumption may not be far off from reality. While investors may be drawn to the three beaten-down dividend stocks above, it's always important to distinguish between drops that were warranted by deteriorating business prospects and those that were the result of Mr. Market's moodiness. Likewise, looking at what may lie ahead for companies facing headwinds today could provide additional support for a thesis to buy what may appear as a bargain stock. Cameco Corp. and Mosaic have both encountered slumps in selling prices for the products they sell but could be due for a comeback in the long term. How long it may take for prices to recover is another matter altogether.